So I ordered mine last week, looking at 8-12 weeks before I get her. I have searched high and low for reviews from folks who has taken ownership and can not find any threads out there. So, who has one? How does it handle with a 115 under load? Comments? Wow! You ordered the boat I want (I think). I am trying to decide between the 18 and 20. What made you go with the 18? I am on Pine Island, Florida with a lot shallow water fishing, but would like to run out to near shore reefs in calm seas. I am thinking the 18 is all I would need. Be capable of fishing flats but feel safe going near shore. Economical enough to use it a lot. I'm very curious how she handles going out in the ocean... Not much on the web. TerryC is right on point as to why I want a 180 too, but would like the 200. When you guys get your 180 please report on it, im curious how rough its gonna be trying to fish in it achored up with the short length. I'm from the texas gulf coast (matagorda) and the south wind is always pushing hard in the summer months. Got ours a few weeks back after a lengthy search. Our dealer found it in Canada. What a great boat. Did not get the package trailer and bought one that is better suited for salt water. The boat has the 150 on it and we've hit 44 mph with 6 folks in the boat. By myself I've hit 49. It jumps right out of the water. 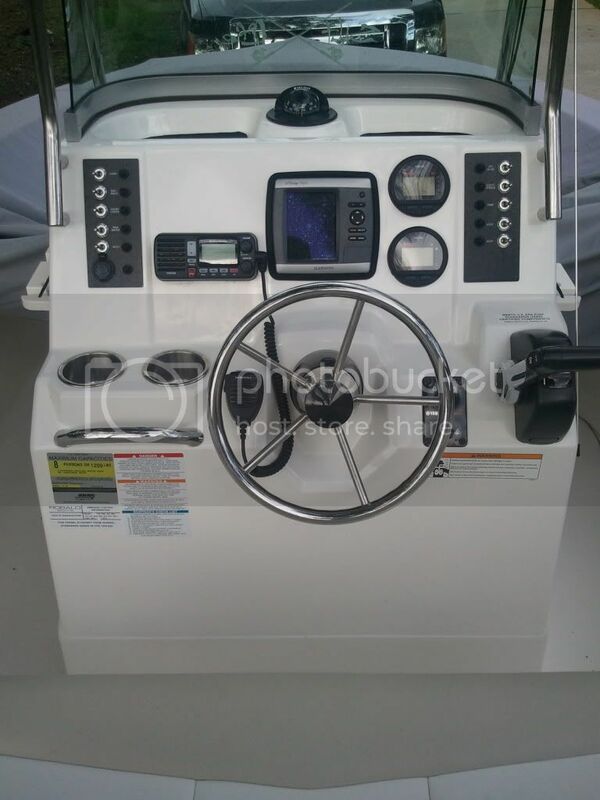 I like the depth of the gunwales and the security it brings to the ride as well as the storage area in the console. Its also very dry. We boat on the Chesapeake Bay and have had no problem with 1-2' swells with alot of boat wakes. As with all boats you have to find the comfort speed and for those conditions, it was very comfortable around 25mph. The boat is solid. The only issue we have is that during wash down, water will get into the front console area. They need to put an extension to the seal or some other fix. Our simple fix was just putting everything in a container to keep stuff dry. At $4/gal it was getting to expensive to run our Sea Ray every weekend and this proving to be a great solution to keeping out on the water. "I'm a newbie to boating so this is the first boat I've ever owned. All I can tell you is we absolutely love it! 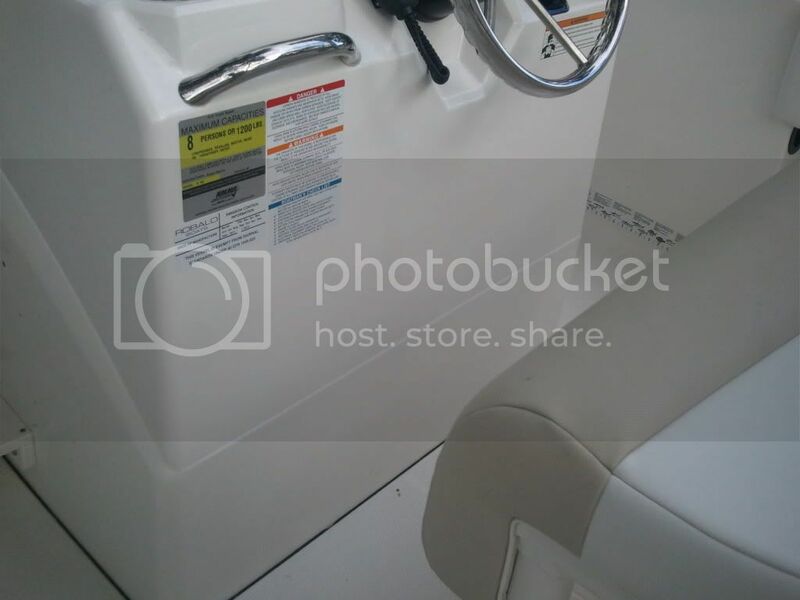 My wife and I looked at a lot of center console boats in the 17 to 20 ft range and this one stood out far above the rest. The Robalo had higher sides, more seating, and more features than many of the boats that were within our price range. A big feature my wife liked was the room inside the cc. It has just enough room to get in there and use the bathroom or change. I pile all my fishing gear in there when its just me and the guys. You won't find that in another 18 ft boat. Performance wise it gets out of the hole well and I've topped it off at 40mph. I take it out in the gulf often and she handles the waves like a champ. Haven't ventured off too far yet still tryin to learn the ropes of the offshore world. The hull design helps keep us dry out there as well. This is an awesome boat and we're very glad we went with a Robalo. We sure get a lot of compliments on it. The ONLY thing I would change on it is the rod holders on the sides of the cc. I think this is simply a design flaw because none of my rods will fit in the upper part of the rod holder. Maybe if they would have put it higher the rods would fit??? Stil trying to figure out how to fix this." To add to that this boat is very capable of going in shallow water and fishing the flats. I go in shallow all the time with no problem (just make sure the motor is trimmed). Like I said above I mainly take it offshore tho...very versatile. TerryC why not flush mount? The cc has plenty of space there perfect for an install. I decided to save some money and do the install myself. I'm not a very handy guy and I accomplished it with no problems...after I got past the fact of cutting a hole in my brand new boat. I put a Garmin 541s and a vhf radio up there and it looks great. Any more questions I'd be happy to answer. I plan using the boat in a similar fashion, flats fishing and running "near shore". Very happy to read real use reports to reinforce the reputation! Mini pearl, funny you mentioned the console flooding when washing. I was concerned about this after seeing a 180 at the dealer after a heavy rain. There was a ton of water in there, I was hoping it was due to the fact the bow wasn't raised and the rain pitched forward (there was a puddle on the deck floor too). Did you guys get the Bimini? Curious about that too as I havn't seen one first hand. 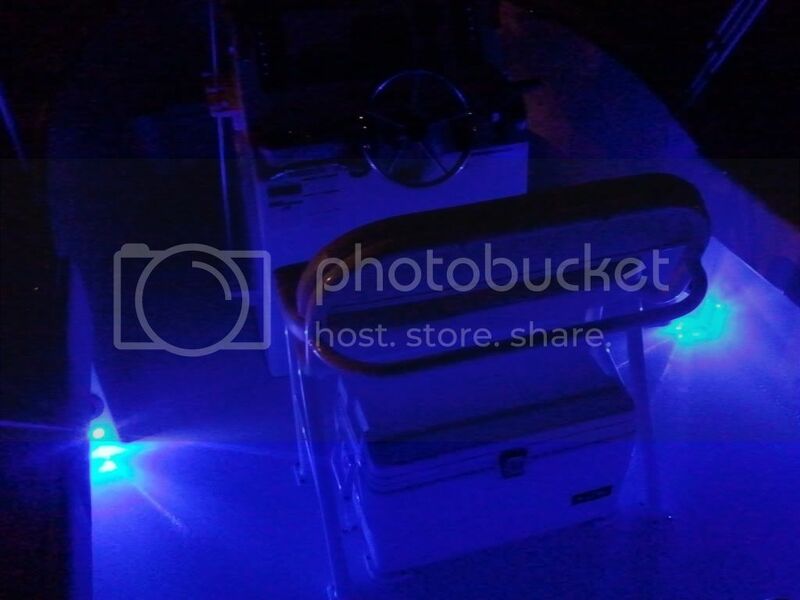 The stock LEDs are mounted in the side wall toward the bottom on either side of the captain's seat and put off a really nice glow from the cc back and provide plenty enough light to move around the boat. They are a real eye catcher at night. 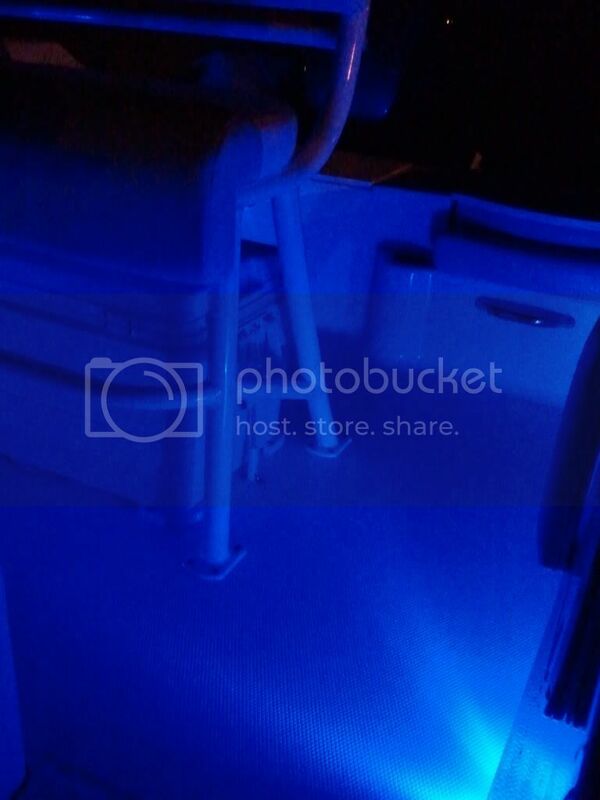 Its another cool feature Robalo threw in. If I were fishing a lot at night I would definately think about adding more. The rope light idea sounds pretty cool. Gotta let me know how that turns out. They could have added one more LED up front to tie them all in but oh well. Yea the prop thing sounds like a hit or miss. I tried calling the dealer and they suggested looking at what pitch I have now and basing it off of that. I'll check out the hull truth. I second the front deck/console flooding! All the water seems to pool up toward the front every time I do a washdown. I don't blame the boat design I just un-hook the trailer from my truck and raise up the front of the trailer a ways and all water drains out no problem. Our boat came with the bimini added on and we love it. Again I don't know much about other boats much less bimini tops but it seems to be real sturdy and provides a lot of shade for the kids. You can store it 1 of 3 ways: laying it down towards the front (for fishing back deck), laying it down towards the back, or keeping it propped upright in its protective cover (which is how I keep mine most of the time). Ideally I would I would have a nice t-top w/outriggers up there...maybe one day. Good to know about the stock LED's. I may order the rop for rod holder area and really light up the floor. I was also REALLY on the fence about a T Top / Bimini. Actually cost me a week or so because I just couldn't make up my mind. The Robalo T Top is just awesome, I just felt it took up casting room and costed an extra chunk of change. 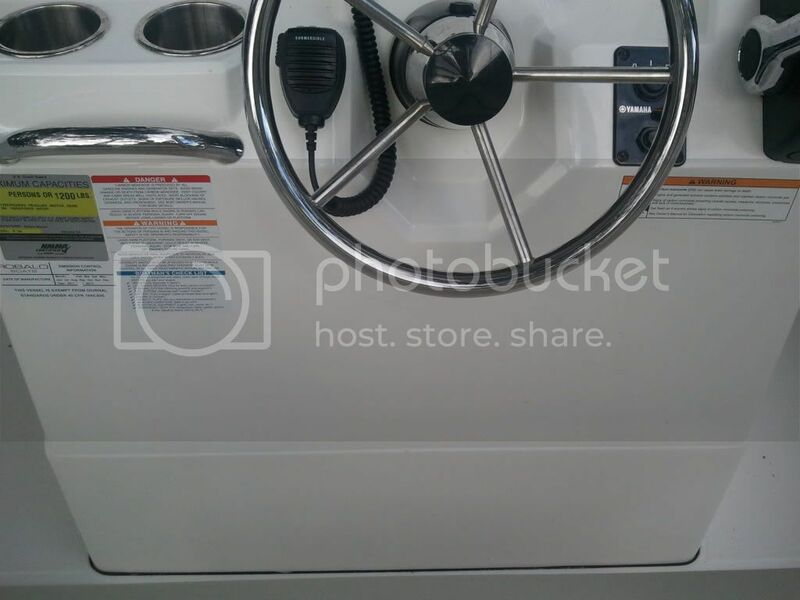 The sales rep spoke very highly of the Bimini as being very well made I just wasn't able to see on. FYI- here's a link to the LED rope light I'm looking at. I have never delt with them before but the product looks too cool!! I'm thinking about a new boat - I have a Sea Chaser 220 bay boat. My wife and I do all near shore fishing out of Hernando Beach, FL in the Gulf. The R180 looks really good on line. I want to be able to keep any new boat we buy in the garage. We have plenty of depth - 24 feet. However, the door opening is only about 80 inches. I can't tell from the website what the clearance requirement is when the boat sits on the trailer. Do you know how tall it is? Looks like a marina here in Orlando has one in stock. So, I might head over there to look at it this week. The specs list it as 6' 4" without a t top. I saw the 6' 4", but wasn't sure if that was in the water or on the trailer. It is also kind of strange that the R200 shows 5' clearance, the R220 6', and the R240 6' 2". I would have expected the R180 to be very similar to the R200 or maybe less than the larger boats. I'm 5' 9" and when standing next to my Seachaser on the trailer, the windscreen seems to be every bit of 6' or a little higher. Maybe one of the guys with one and measure. I'm still waiting. I hope this don't steer you away from the Robalo but there is no way it will fit in your garage. Length wise you are good to go but height is definately an issue. I just took some measurements to give you an idea...My garage has an 83 inch clearing. My boat sitting on the trailer with the jack lowered all the way down sits about 8-9 foot at the highest point (center console). I too was like you and hoped to store it in my garage but quickly found the height wouldn't allow. The day after I purchased the boat I had to settle with going out and purchasing a boat cover. Thanks for being our eyes!!! No problem...that sounds like something I'd be interested in. I will take a look when I get home. Might even post some pics if I can figure it out. Now my only concern would be the width, 25" may be a bit wide. Didn't think of that until now.... What do ya think? The storage box would be a great addition. Now I'm thinking about getting one. I took a couple measurements to make sure it would work...looks like it would go with no problem. Width- 35 1/2 inches, Height (to steering wheel dip in the center) 24 3/4 inches. Also I took a few pics of the led lights at night to give you an idea of how much light they put off. As you can see it puts a nice glow in the boat, but there needs to be one more up front. Wow those are a lot brighter than I would have thought! I did order two down courteously lights for the sides of the console to add light towards the front, I think that will most likely be all I need after seeing those pics. 35" on the console seems wide but I'm leaning towards calling Robalo to see if I'd be taking away too much structural integrity since the door on the front adds none to the console. I'm afraid if I cut the console and only leave 5" on each side it may twist, unless I add some backing for support. I like your powder coating! I didn't get that option. My Fiance and I just took delivery on a 180 with the 115. We also boat in the Chesapeake Bay and surrounding waters around the Annapolis area. Lets just say that we LOVE this boat. She handles the 1-3' waves great! With 4 people on board, we've cruised on plane at 4000 rom going about 20-23 mph. So far we have traveled at various speeds and in various conditions about 50 miles, and have taken about 1/3 of a tank of fuel. The only downside we have seen so far is a lack of storage around the console. We'd love to have one more area to put some small items in. Can't wait for the workday to end so we can go back out this evening. We have the R180, and have the 150 on it, and absolutely love it! Wife really likes the built in head, for the obvious, as well, storage. Found it to be a little rough in the Gulf of Mexico, but as a new boat owner, I'm a little skitish to go way out. The Robalo fold up biminy is wonderful, covers the entire wide of the boat, instead of the permanant style, and gives more shade and protection. only thing we wish was the 18 has a smaller sitting area up fromt, than the 20, so that's the sacrafice. Glad we did the 150 upgrade from the 115, really gets up with a load, and cruises quickly at 22-28 mph smoothly, maxes out at 39-40 mph. Any one have any recommendation ?. Interests:boating, fishing, hockey, boat racing. 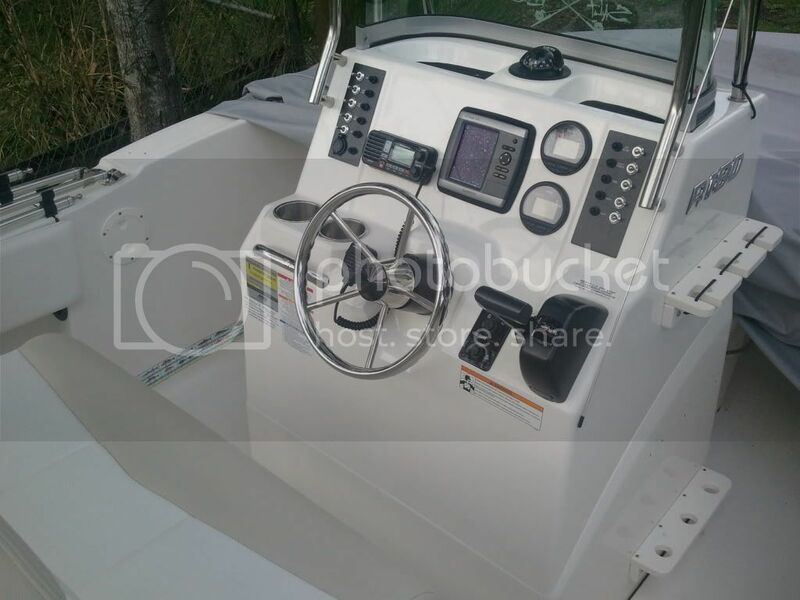 ..I have a 2012 R180, Love it !....has the Bimini, I updated to the 150,(a must for me) added Lenco Trim Tabs, I cut out and installed the optional footwell the foot well/glove box panel. Added midship pop-up cleats, ( the 2012's did not have them yet) .I just did a gen 3 , 9" lowrance flush mount.......The trim tabs are a absolute must for me too, "seriously" made a new boat out of it in the 3 foot slop ....I made some little rubber bushings between all the screws on the Bimini top ( it rattled badly)...I had canvas made to cover the console and seat, and a piece across the back seats..(water was leaking on the Batteries, bad design back there)....also bad design to maintain the bilge area, you have to be a octopus... But I run the hell out of it, Very dry boat, .Cruises 32, top end is very near 50 ..nice .....Just amazing compared to others I've been in 18 feet. also I might add, I got it in my 7' high garage by removing the windshield and compass for winter storage...... .Enjoy ! My wife and I have a R180 with the 115 and we love it. It has exceeded my expectations thus far. I was a little worried at first with it being out on the Great Lakes here in Michigan but it handles the big lakes great, we had it out in November musky fishing with 5 footers and were amazed. With the 115 I can run about 39 with the wife and two kids in the boat with a full load (tackle boxes, rods, kids toys, etc.) and when we had 5 adults and my two sons we still ran about 35-36. My brother who runs a Lund in our walleye tournaments was amazed with how much smoother and dryer the R180 was than his 19 foot Pro-V, comparing it very favorably with the 20+ foot rangers that a lot of the guys we fish with run. With that all said, I do wish we would've went with the 150 just because when we do add our t top I think we might lose a mph or two with the extra resistance. Down the road we will probably repower with a 150 or just go with the 246 Cayman as we have become very big Robalo fans since buying ours.